This past month I started research on the causes of the high rates of malnutrition in Gaza and the West Bank and decided to read Dr. Izzeldin Abuelaish’s I Shall Not Hate: A Gaza Doctor’s Journey (Toronto: Vintage Canada, 2011). Abuelaish is an obstetrician/gynecologist who has practiced in Israel with Jewish Israeli colleagues: currently he lives in Canada. As you might remember, Israel fought a brief war in Gaza in 2008-09, in which from about 1150 to 1450 Palestinians were killed, according to the Abuelaish and the Goldstone Report on the war. Abuelaish stayed at home in Gaza during this war with his eight children and various relatives (his wife had died of leukemia a few months earlier). In the afternoon of January 15, 2009, several of his daughters and nieces went to their bedroom to read and do homework. Suddenly, a rocket hit their room. Three daughters and a niece ware killed. Abuelaish saw his daughters’ body parts all over the room; one daughter was decapitated. Another daughter was alive, but standing with one eye on her cheek and and one finger dangling from its skin. Because of his contacts with the Israeli media and his medical colleagues, Abuelaish was able to get his daughter and one of her injured cousins to hospital in Israel and save his daughter’s eyesight. Most Palestinians were not as fortunate. Abuelaish describes in horrifying detail what it’s like to live under bombardment, afraid to go out, afraid at any moment that one will be attacked. Abuelaish also describes the day-to-day humiliation and harassment of Palestinians from Gaza trying to live ordinary lives. Even as a doctor who, as the border guards knew, worked in an Israeli hospital, he was frequently harassed, forced to spend hours waiting before he could cross into Israel each Monday and return home each Thursday. When his wife was dying, he was in Europe. Obliged to return earlier than expected, he had to get multiple new travel permits. As a Palestinian, he was not allowed to fly directly into Israel and had to go to Jordan instead, then cross the border. What should have been a very short journey took him hours and hours, as various guards and officials calmly ignore his pleas to get to his wife’s bedside as soon as possible. I usually find bromides such as “the torturer is degraded as much as the tortured” irritating. I think there are a lot of people out there who live very happy lives despite the awful work they do, as Robert Jay Lifton explained in 1986 through his concept of “doubling” which explained why SS doctors could oversee the mass murder of Jews every day, then happily go home to a normal family life in the evening (see Lifton’s The Nazi Doctors; Medical Killing and the Psychology of Genocide, New York: Basic Books, 1986). But I think the Israeli-Arab conflict has indeed degraded Israeli soldiers. Yes, there is a genuine problem of security because of suicide bombings and rockets sent from Gaza into southern Israel (both of which Abuelaish opposes). But there are also people trying to cross from Gaza to Israel to obtain emergency medical treatment, detained for hours at a stretch, and women giving birth at the border post because they can’t get across to the Israeli hospital. Abulaish’s intimate description of the humiliating treatment with which he had to put up, even as a doctor, gives only a hint of what less well-known Palestinians must experience. The Israeli guards sound arrogant, cruel, and full of hate; they seem to enjoy causing unnecessary suffering. This is indeed degradation, and one wonders what its long-term effects are on Israelis, since so many people spend some time in compulsory military service when they are young. (Super-religious Jews don’t have to serve in the military, but that’s another story). In my last post I wrote about Holocaust reparations, and how fragile reconciliation can be. The Israeli government admitted that the attack on Abuelaish’s house had been a mistake, and promised him compensation for his daughters’ deaths, but as of the time of publication of his book he had not received anything. And the Israeli government did not apologize: it should have. 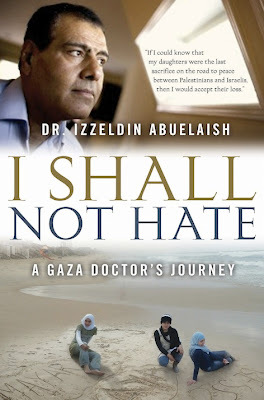 It is amazing that Dr. Abuelaish can say, “I shall not hate.” In his circumstances, I certainly would. I will write more on Israel/Palestine as I learn more.